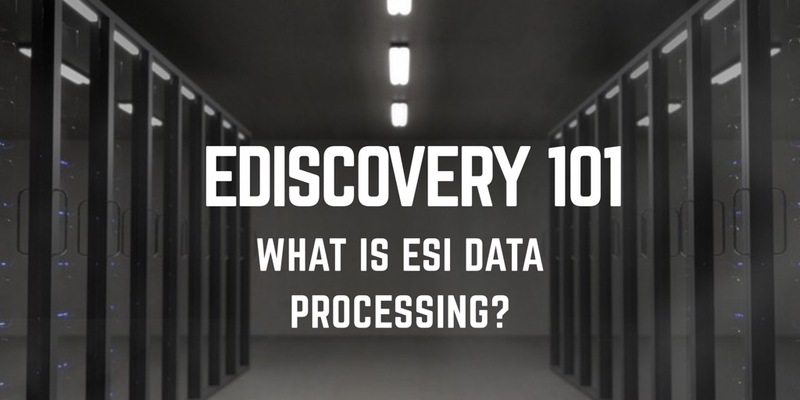 eDiscovery 101: What is eDiscovery Data Processing? What is eDiscovery Data Processing? Data processing of electronically stored information (ESI) is an important part of the eDiscovery process. But what is it exactly? Check out this guide to eDiscovery data processing to learn more. Electronically stored information, commonly referred to as ESI, is changing the digital landscape of the litigation industry when it comes to discovery. It helps legal counsel access important information they need to win legal cases much faster than paper. But what exactly is the technology used to manage it and what does data processing have to do with anything? In this article, we’ll discuss eDiscovery data processing. We’ll talk about the basics, how it is used, and its benefits. In short, eDiscovery means electronic discovery. eDiscovery data processing is taking data stored in the regular course of business and converting it to a useable format for review, research, analysis. In order to minimize disruption to a business or person involved with a legal action as well as reducing spoilation, data from computers, social media, and mobile devices are collected for processing. A copy of that data is “processed” which basically means the process extract pertinent data (metadata), performs OCR for documents that may not be searchable at the time of collection, and some systems identify protected personal information (PPI) such as credit cards and social security numbers. Then legal teams use the information to prepare productions by reviewing and analyzing this information to determine what data is responsive. As the process of producing ESI has gotten more standardized in legal discovery we have seen some metadata fields become standard place. Examples are Email TO/FROM/CC/BCC, Subject, Author, and Dates. eDiscovery data processing allows firms and support teams to handle electronic document search requests. It saves employees hours of time that they can spend on other tasks versus sifting through paper records. The technology accesses the ESI metadata and allows users to perform searches and use analytics such as Natural Language Processing to peek into the data. The type of information collected may include email communications, chat application conversations, business documentation and website content. Or, accounting and company databases and other electronically stored data. The process of identifying data typically begins with a legal hold notice. Recipients may also provide feedback to counsel as to where data may be stored and who else they may have communicated with regarding the issue at hand. As you know, no one can erase, edit or delete the files which falls under Rule 37 for those matters operating under or adopting the US Federal Rules of Civil Procedure. The collection process begins after counsel knows who has created information and where it may be stored. As ESI is processed, the software separates irrelevant electronic data files such as NIST files and duplicates to minimize documents for analysis and review. The eDiscovery system, such as Cicayda Reprise, houses the documentation in a secure cloud environment. Now it’s ready for reviewers to access it for legal review and analysis. Legal teams often prefer changing formats of the electronic documentation into static formats. Over the years we have seen the standard file type change from the TIFF to the Portable Document Format (PDF). This allows documents being produced to have a physical Bates stamp endorsement on every page. This process is still the most preferred in litigation because it allows an attorney to reference a page in front of a witness being deposed or a jury by referencing the Bates Number. First, the legal hold notice is provide once a complaint is received. Counsel begins determining where all the data is housed that may be pertinent to the incoming or upcoming discovery requests from the opposing counsel. Then, legal professionals on both sides establish the scope of the relevant ESI through various discussions which falls under Rule 26(f) for those matters operating under or adopting the US Federal Rules of Civil Procedure. Counsel negotiate which search parameters they will identify and what data parameters may be appropriate and proportional. The data is collected on both sides goes through data processing into review. Independently, these data sets are reviewed and they determine what should be produced as evidence or what is not responsive. The final step in the review to produce phase of discovery is to produce to the other side the documents and data determined to be responsive. It doesn’t stop there though! Just as you produced documents, you will also receive. Sometimes you receive more documents and data than you produced. It is important to have a true research and analysis eDiscovery platform in order to reduce time in analyzing both sets of data. You can access other electronic data and files. The data depends on the software a company uses. Data processing involves three significant components. The first component is text extraction. Text extraction allows searches to happen against all the textual content contained in the files. Of course, not all files are searchable but this step helps ensure that files that can be are in fact searchable. The next component of data processing is metadata extraction. Metadata extraction enables the legal team to see, search, and sort specific data about a particular file. Some examples include who created the file, the date of creation, and the file’s properties. The third component of data processing is file hashing. File hashing enables you to locate duplicated files. There are many types of hashes but the most widely used in the legal field is the MD5 hash. Hashing technology develops a digital signature for each file using data encryption. After the files are hashed they receive the same digital signature as the duplicate. This helps the legal team avoid searching duplicated files. Now you know more about eDiscovery data processing! You’ve learned its purpose, uses, and its benefits. The legal process can be tedious and expensive. Wouldn’t it be nice to make it easier? Want to know more about how you can use eDiscovery for your law firm? Contact Cicayda & learn how.